This is one of those projects that I’ve been thinking about all week because I’m so excited to share it with you guys! I love it when something in my head actually works and turns out even better than I had imagined. 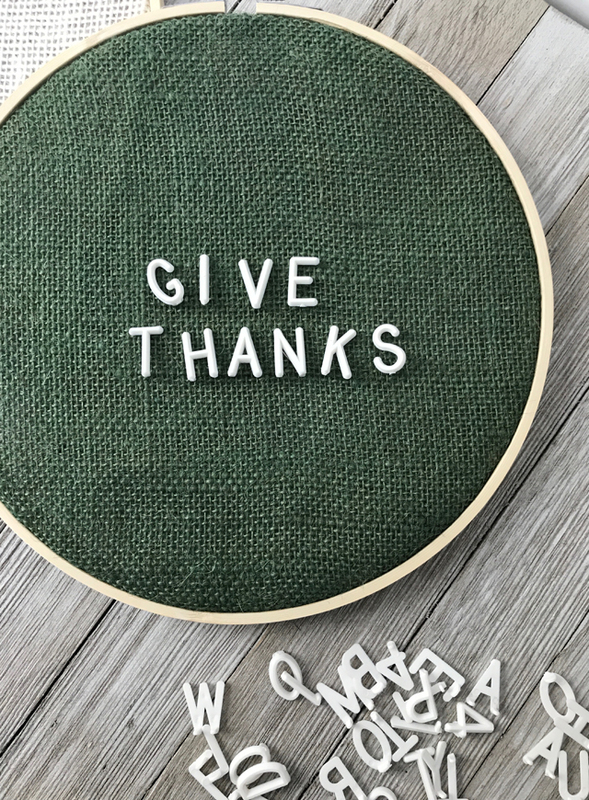 These letter board embroidery hoops are my very own creative brainchild, and the reason I’m so pumped about them is that anyone who has letter board letters at home (which is probably 90% of you) can make one! 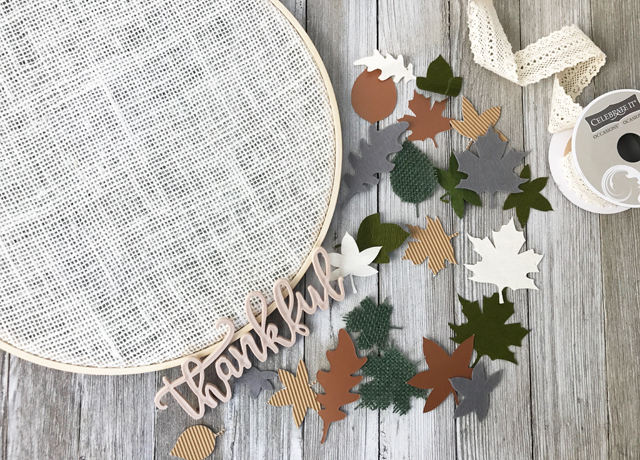 I’m going to show you how to create a Fall wreath version and a few smaller hoops perfect for your Thanksgiving table. 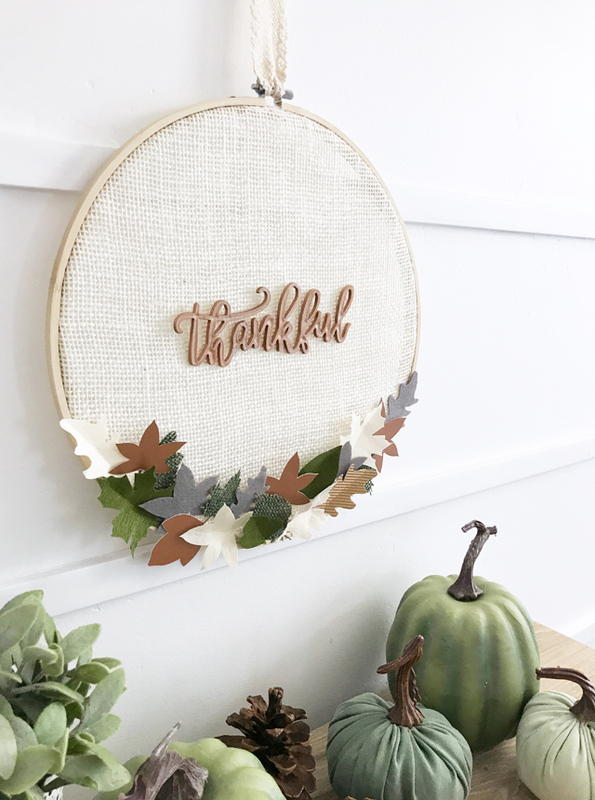 Here is the embroidery hoop wreath, which I embellished with a letter board accessory and variety of leaves cut with the Cricut Maker. My color inspiration for my Fall decor this year was taken from these beautiful green pumpkins from Target. I used a base of cream, gray, and copper to create a lovely neutral color story with a pop of green! Colored burlap – you can get it by the yard at your local fabric store for approximately $4/yard. 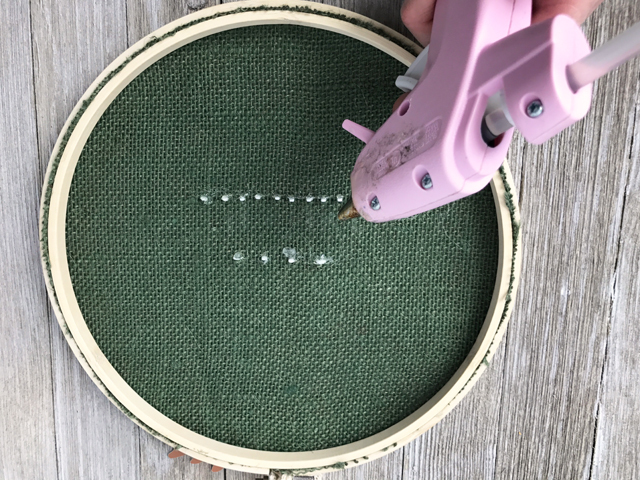 Start by separating your embroidery hoop into its 2 parts and slip the burlap fabric underneath. Secure it and pull the fabric tightly around the edges before tightening the hoops together. 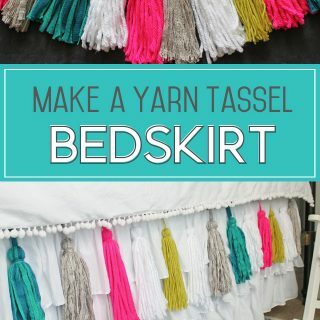 This will keep the burlap in place and you won’t even need to glue it! 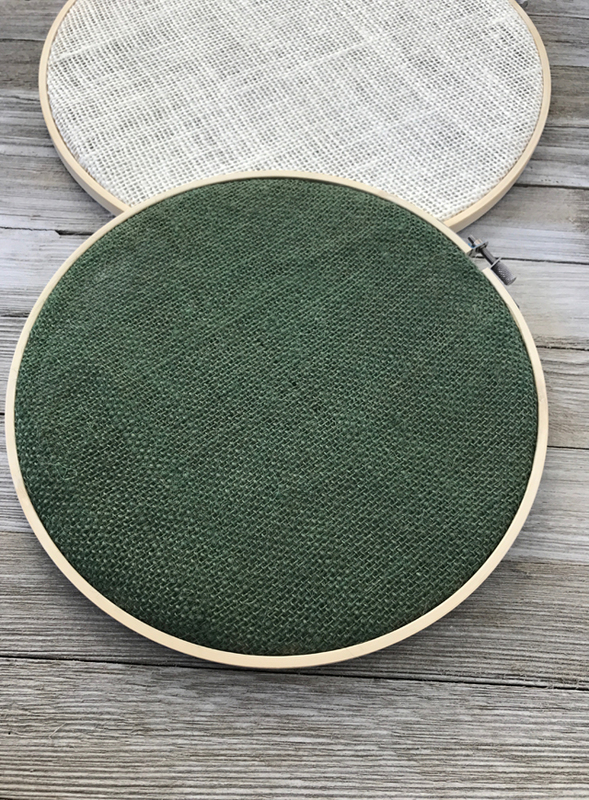 Once the hoops are tightly fastened together, trim the burlap on the back side very close to the hoop to create a nice finish. Next, get out your letter board letters! 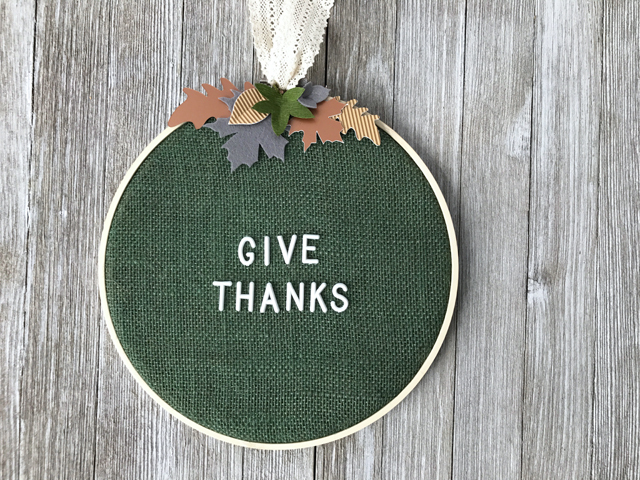 Place the letters in the center of your hoop or wherever you would like them. 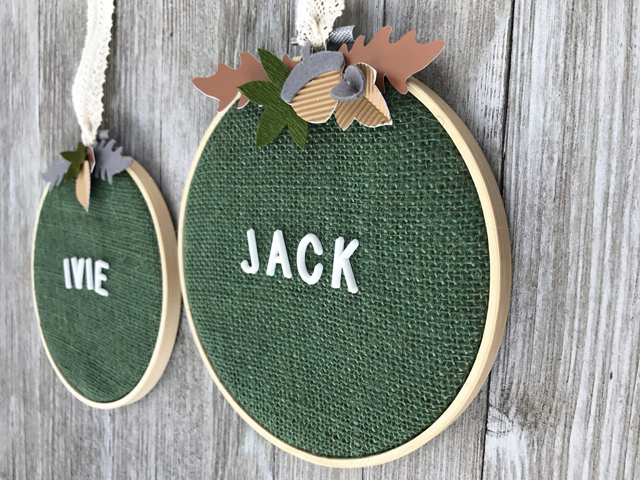 Once you have a good idea of where to place them, you can actually stick the letters directly into the burlap fabric because of its open weave! You may have to wiggle them a little to make the natural opening a little larger, but they should poke directly through the burlap to the back side. The majority of the project is now done! 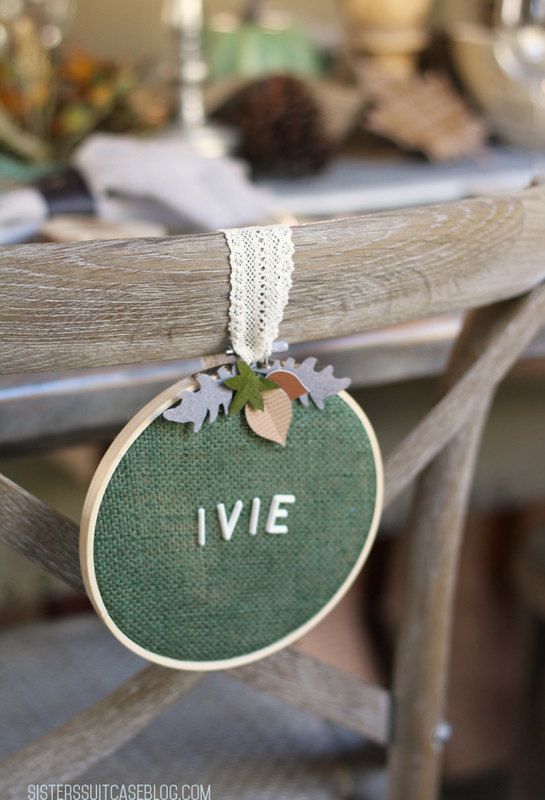 You can embellish the hoop however you want to… floral stems, ribbon, berries, leaves, the possibilities are endless! 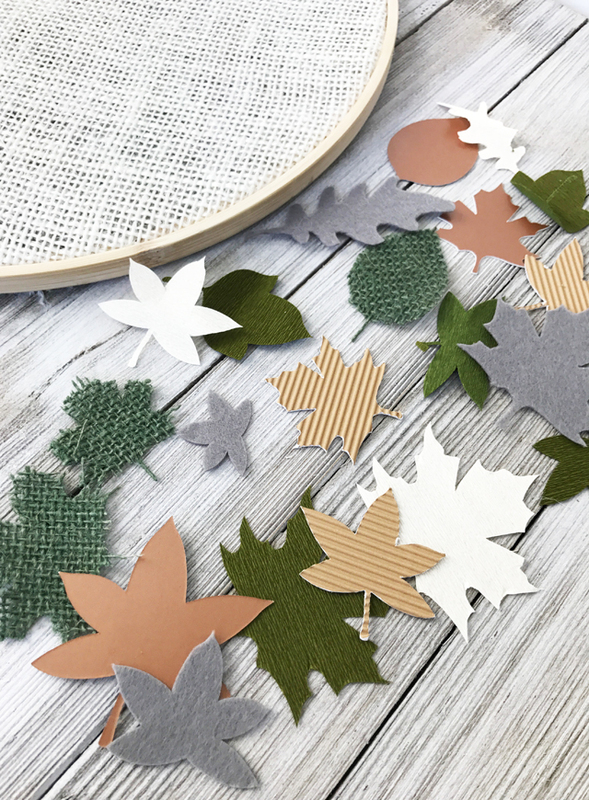 I decided to create fall leaves in different materials to give a variety of texture and color. 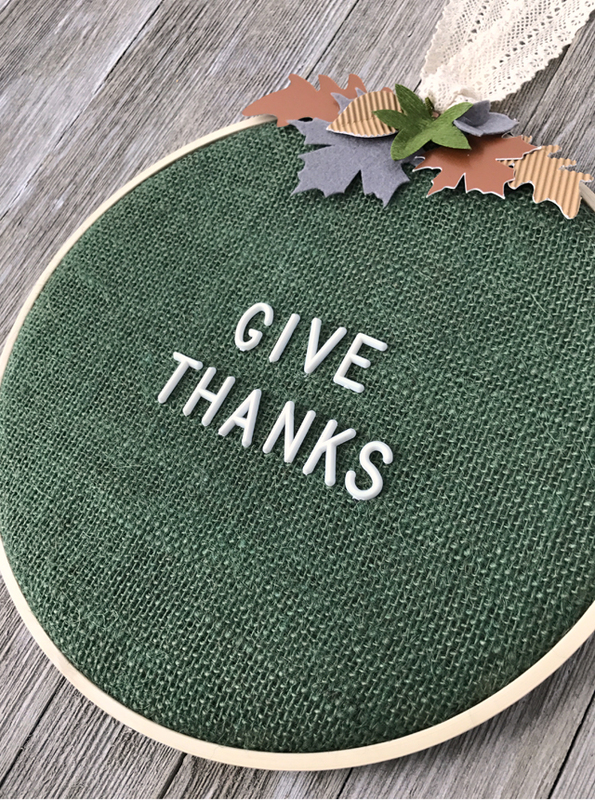 I used the new Cricut Maker electronic cutting machine and it is amazing!!! The new rotary blade makes it possible to cut through virtually any material like butter! 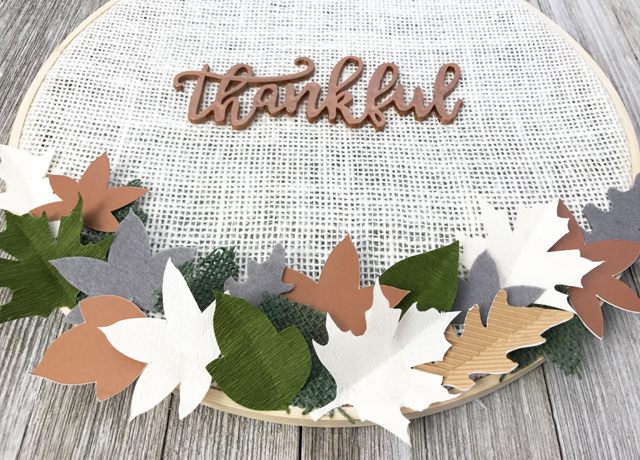 I wanted to put it to the test so I tried several of the Cricut materials, as well as the burlap I had on hand. It truly is amazing with how precisely it cut through all of these different materials! 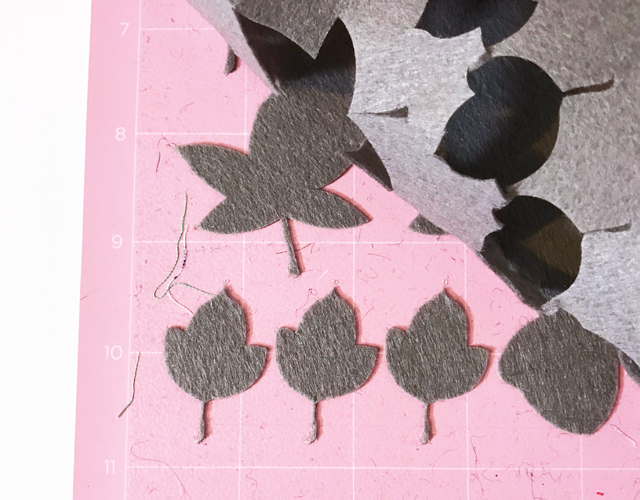 I used hot glue to add some leaf embellishments on the outer edges of the embroidery hoops. 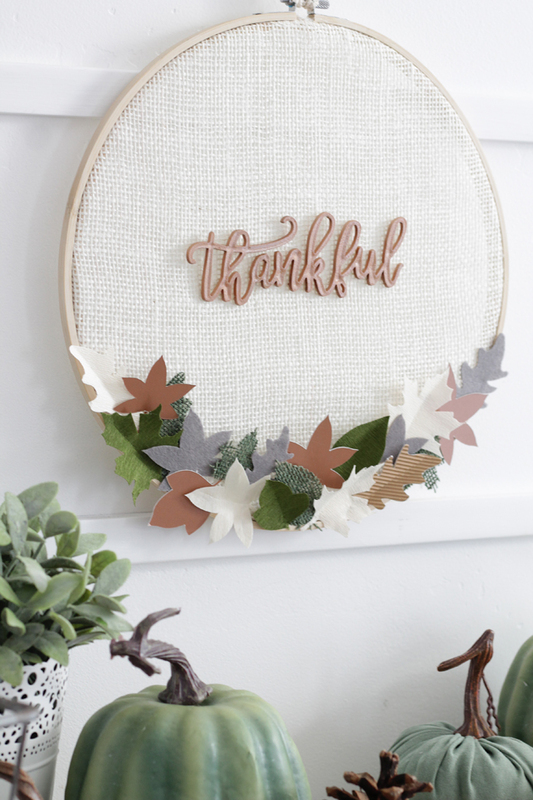 I spray painted the “thankful” letter board accessory with Rustoleum hammered copper spray paint. 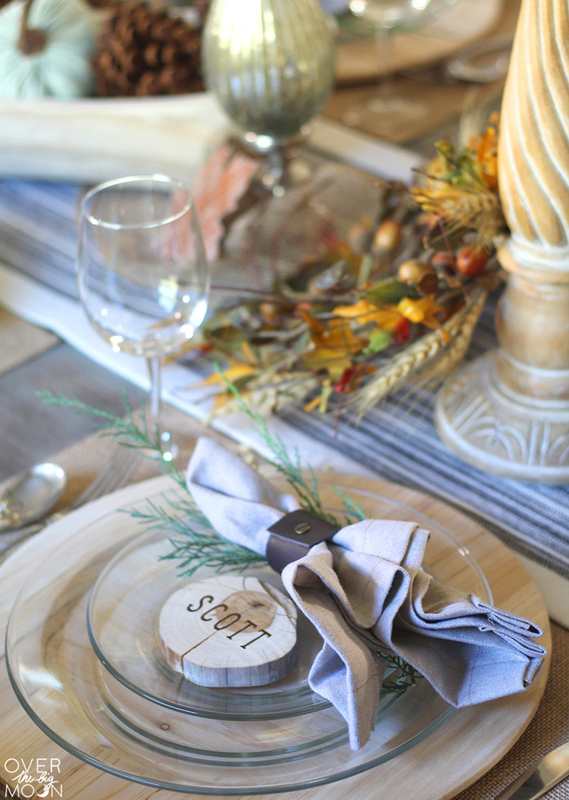 I really do love how the cream burlap looks with all of the leaf accents. They look so cute hanging from the back of the chairs! 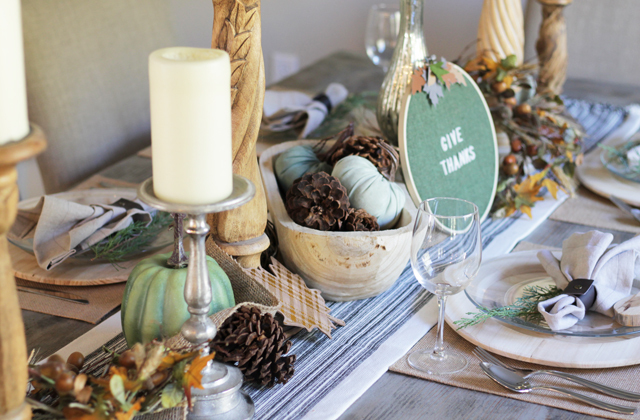 You can see a little sneak peek of this elegant farmhouse Thanksgiving table that my talented friend Pam at Over the Big Moon created. 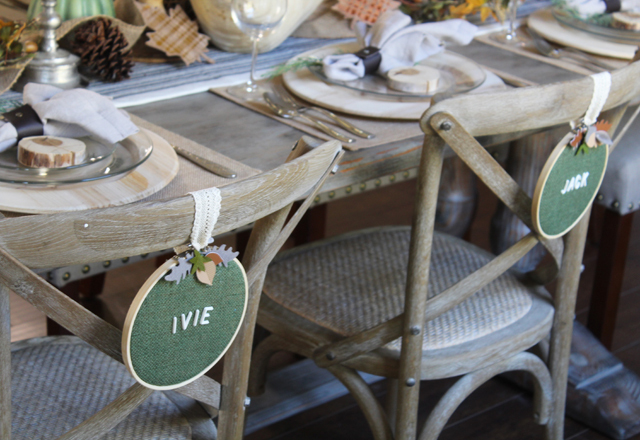 Look at these amazing place settings she DIY’d… leather napkin rings and personalized wood slices as name cards! I’ve already planned out my Christmas versions of these (so stay tuned!) 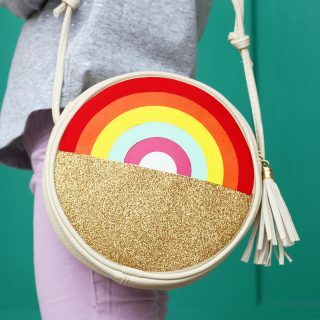 There are so many fun ways you could make these letter board embroidery hoops! If you make your own, let us know. 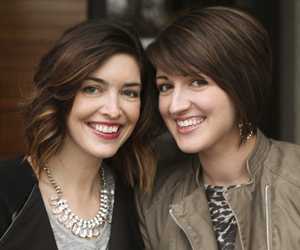 We’d love to see how they turn out!